The Kimberley Process forum was established in 2000 following a public debate as to whether the diamond trade funded conflicts in certain countries. Bloody civil wars that took place in Sierra Leone and Angola were linked to a battle for control of these countries’ diamond mines. The natural resources of these countries, including diamonds, were used by rebel groups to buy weapons; therefore, trade in these diamonds was defined as the “blood diamond” trade or “conflict diamond” trade. A civil war also took place in the DRC (Democratic Republic of the Congo), where diamonds were labeled as “conflict diamonds”. The blood diamond issue underwent a public debate, and the United Nations, with the assistance of non-governmental organizations that examined the issue of conflict diamonds, claimed that the trade in conflict diamonds encouraged wars in African states. The United Nations Security Council imposed decisions 1173 and 1176, imposing sanctions on trade in blood diamonds from Angola. Even though the trade in conflict diamonds represented a small fraction of the global diamond trade (around4%), it did damage the reputation of the global diamond industry. The diamond sector did not want to garner a negative reputation like the fur trade did. South Africa, Botswana and Namibia, African countries where there were no civil wars and where the diamond trade was legal, sought to protect their legitimate trade in diamonds. These countries initiated a conference, inviting non-governmental organizations as well as representatives of the diamond sector. They focused on how to deal with the problems of conflict diamonds. The first such forum took place in the town of Kimberley in South Africa, hence the name the Kimberley Process. Over the years, the forum established follow-up procedures, documentation and control over the transport of rough diamonds in the world. 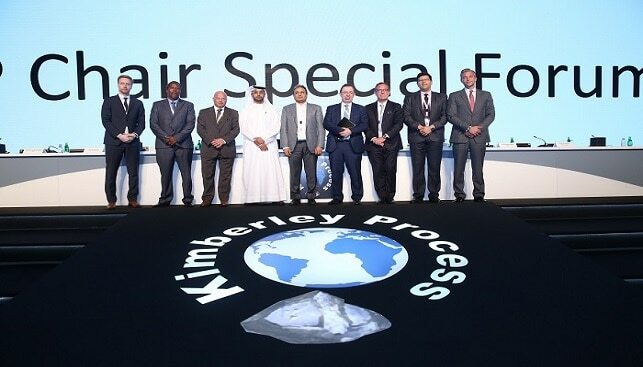 The forum set up the Kimberley Process Certification Scheme (KPCS), which requires all rough diamond imports and exports to be accompanied by a formal certificate of the exporting country. The list of countries participating in the Kimberley Process is published at the KP website. Countries not complying with the required conditions are suspended from the scheme, and diamond trading with these countries is prohibited. 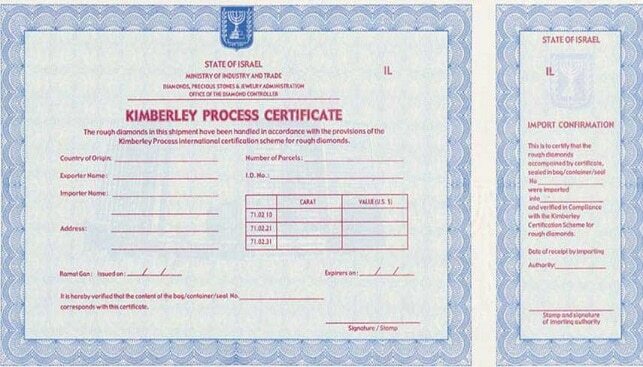 The Kimberley Process went into effect on January 1, 2003, and Israel was the first country to issue a certificate. 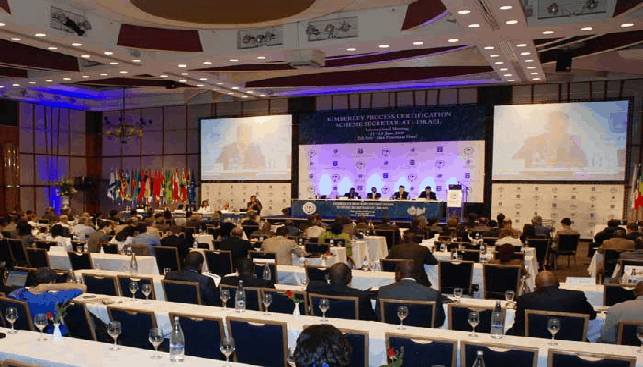 The Kimberley Process forum meets every year in a different country, and discusses issues related to strengthening and updating the controls over conflict diamonds. 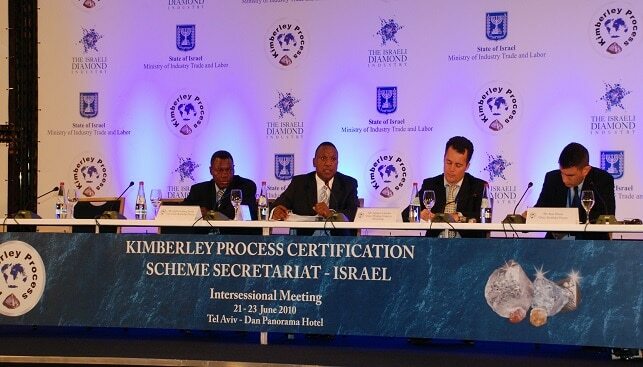 In 2010, Israel held the position of Chair of the Kimberley Process, and hosted the Kimberley Process conferences.